When all hydrogen in the core of a star is spent the hydrogen fusion migrates to its outer layers. The hull of the star is driven outside by the radiation pressure, the star increases its diameter up to a hundred times. So far outside the surface cools down to 2000 - 4000 kelvin and shines red. 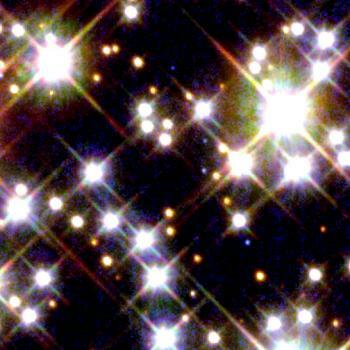 Although the surface temperature is lower than before, the star has become considerably more luminous than before and produces by far more energy. Red giants very often pulsate and in doing so change their brightness. The hull slowly flies away into space, the white glowing, but inactive core stays behind - a white dwarf.